Google Translate can be used to translate many web pages, but you can't use it for pages that require login and for Ajax-powered web applications. You won't be able to translate a Gmail message, a Google Docs document or a Facebook message without copying the text to Google Translate. I've mentioned in March that Google Toolbar tests a translation feature that extracts the text from any web page and translates in real-time. The impressive feature is now available in Google Toolbar 6 for Internet Explorer and it works extremely well. By default, Google detects when a page is not in English (or another preferred language) and it offers the option to translate it. Language detection doesn't send text from the current web page to Google's servers, but you'll need to send the text when you translate the page. "When you visit a webpage in a different language than your Toolbar, Toolbar will display the translation bar near the top of your browser window and ask you if you'd like to translate the page. Click Translate to translate the page, or click Translate on your Toolbar. Click Show original or the x icon to close the translation bar and view the original webpage. If you change your preferred translation language, Toolbar will remember your language preferences and use them when translating pages in the future," explains Google. 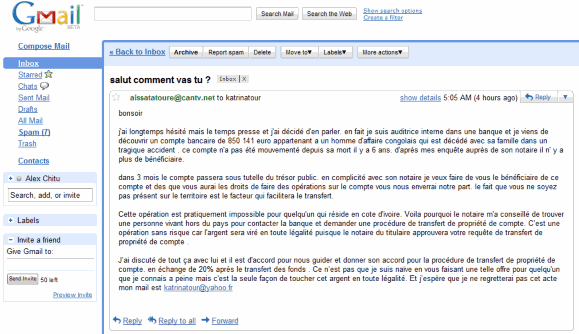 If you open another Gmail message written in French, Google Toolbar will automatically translate the text. "The new Translate feature is available in all international versions of Toolbar, including English, and the translation service supports 41 different languages: Albanian, Arabic, Bulgarian, Catalan, Chinese, Croatian, Czech, Danish, Dutch, English, Estonian, Filipino, Finnish, French, Galician, German, Greek, Hebrew, Hindi, Hungarian, Indonesian, Italian, Japanese, Korean, Latvian, Lithuanian, Maltese, Norwegian, Polish, Portuguese, Romanian, Russian, Serbian, Slovak, Slovenian, Spanish, Swedish, Thai, Turkish, Ukrainian and Vietnamese," mentions Google's blog. Another improvement is that Google Toolbar's word translator is now available in the 41 languages supported by Google Translate. please notice that the translation of the subject of the example email is terribly wrong ! Google translates pages by computer. 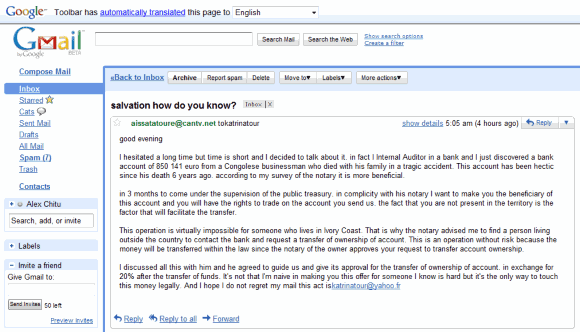 Machine translation is difficult to do well and tends not to be as clear as human translation. But it can give you the gist of what’s written or suggestions for translating something into another language. I too am amused at the source of the example. Might there be a better choice or is this merely an education campaign? In my views human translation is best and clear then machine translation. The concept is no doubt very nice and will come handy. But then it might not be good at translating emails or content written in colloquial language, which machine translation in general is not able to do well. Para brasileiros como eu que não fala a lingua inglesa, é a melhor ferramenta da atualidade. Hoje navego com facilidade por toda internet com muita facilidade. A tradução está muito boa, fácil de compreender, é expansível para todas as páginas de qualquer site, evitando a perda de tempo de se ficar traduzindo parcialmente algumas páginas. O Google Toolbar está magnífico. Poupou tempo, e nos dá a impressão que todos os sites do mundo agora são brasileiros. Toda pessoa inteligente que gostas de viajar pela Internet deveria baixar essa maravilhosa ferramenta. My client's site is stated to be in French in the Google toolbar when it is clearly in English. I have the proper tags in the head section but they are not recognized. nice feature, as before mentioned machine translation won't be able to get the full context - but for a first draft translation its ok. I use it for my blogspot blog - but didn't come across yet how to translate 'current page' code - just paste in the standard code with the fixed url. So have to search on. just to add - the german site 'linguee com' offers a great tool for GER-EN translations - as it searches for human translations on websites and present the results in a table - I wonder why google didn't come up with this. Having switched over to Gmail a few months back, I rely on the translator quite a bit. Sometimes still a bit buggy, but overall it is a great tool. Please note, that the Czech translation of Google Website is incorrect. Even though the words and expressions are understandable, they are usually not used by Czech speakers at all or they sound like translated by a robot. Some sentences are only understandable to me because I speak English (almost everything has been translated literally and it does not make sense in Czech) I would like to contact someone from the Czech Translation team to provide some corrections. At this moment the Czech translation of Google website does not look natural and the the translation is not professional at all. I actually use the joomla plugin of this google translate feature. It's quite amazing. Pretty cool tool. I like the way that Google keeps coming out with these nifty tools. However, the translation can never be perfect and is no substitute for a human.